Be the first to share your favorite memory, photo or story of Kayla . This memorial page is dedicated for family, friends and future generations to celebrate the life of their loved one. 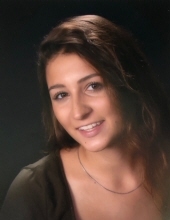 WINSTED – Kayla Jane Lombardo, 19, passed away on Tuesday, November 27, 2018. She was the loving daughter of Mark and Karen (Young) Lombardo; born May 10, 1999 in Farmington. Kayla was a recent graduate of Gilbert High School and had attended classes at Northwestern Connecticut Community College. She was a fun spirited individual with great artistic talent who enjoyed camping, trips to the beach and spending time with her family. Kayla loved animals especially her family pets. In addition to her parents, she leaves her older brother and best friend, Garrett Lombardo of Winsted; aunts and uncles, Regina Lynch and husband Kevin of Winsted, Val McDonald and husband Matt of Winsted, Sandi Young of FL, Steven Young and wife Susan of Winsted, JoAnn Leifert and husband Michael of Winsted, Michelle Young of Torrington, Denny Young and wife Donna of VT and Michael Serafini of Torrington; many close cousins and friends. She also leaves her beloved cat, Gaia and dogs, Lexie and Maggie. She was predeceased by her close grandma, Rena Young; paternal grandparents, Joseph and Janet Lombardo; aunt, Rosemarie Lombardo; and uncles, Wayne Lombardo, Joseph Lombardo, Jr., and Arthur Lombardo. Friends may call on Monday, December 3, 2018 at Montano-Shea Funeral Home, 922 Main Street, Winsted from 4 – 7 PM. Funeral services will be held on Tuesday, December 4, 2018 at Montano-Shea Funeral Home, Winsted at 11 AM. Graveside services will be held on Saturday, December 8, 2018 at Forest View Cemetery, Winsted at 11 AM. In lieu of flowers, memorial donations may be made in Kayla’s name to CT Greyhound Adoption, PO Box 900, Avon, CT 06001. To plant a tree in memory of Kayla Jane Lombardo, please visit our Tribute Store. "Email Address" would like to share the life celebration of Kayla Jane Lombardo. Click on the "link" to go to share a favorite memory or leave a condolence message for the family.